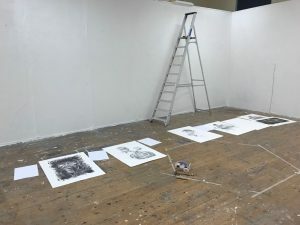 Over June 26 – July 6th 2018 a PhD Lab entitled Take Over was coordinated by Dr Jakub Cleglarz in a suite of studios in Birmingham School of Art. 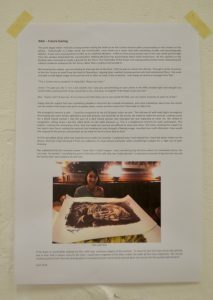 My contribution was a small exhibition of a selection of silk screen drawn prints from my series People in the Arts, with specific commentaries. Contemporary Portraiture. A journey between digital and analogue. This practice led interdisciplinary research explores the value of using smart phone digital photography as a basis for contemporary portrait drawing, printmaking and how this process alters the meaning of the image. 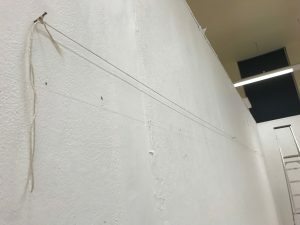 The ‘show’ was framed with ‘tape texts’ and the selected art works were hung using magnets and the accompanying texts taped in place with masking tape. The Lab was an opportunity to continue contemplating the issues challenging the theoretical bases of my and practice as I investigate the underpinning foundations. 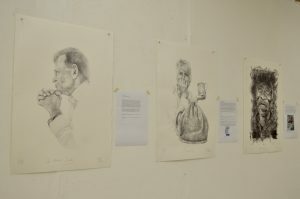 Formally exhibiting the drawn and printed portraits provided an opportunity to review the issues at hand at a useful distance, rather than during or at the end of the process of making. 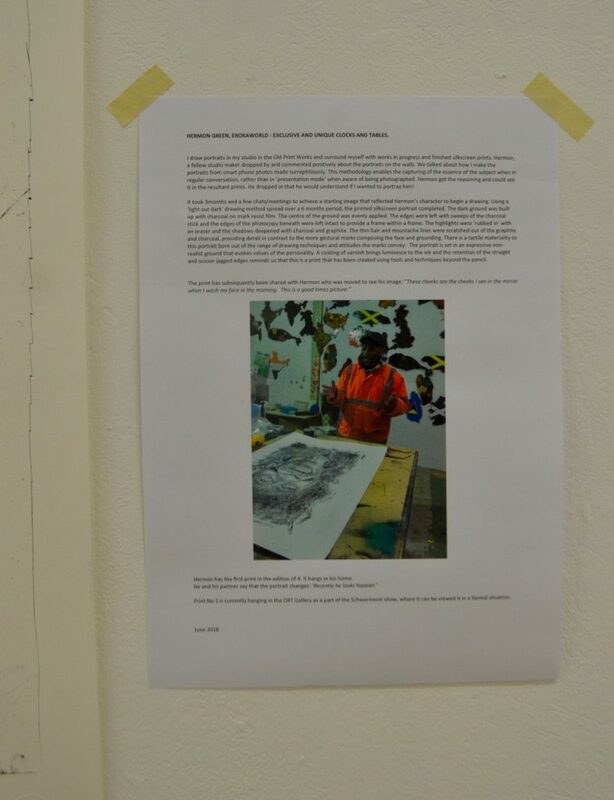 It was also an opportunity to write short critical reflections to aid my understanding of my making. These could also aid the viewer’s positioning of the representation of the subjects through the developing Digital and Analogue journeys I am taking. Through my practice-led research outlined above, initial encounters act as a collective ‘moment’ whereby their singular, combined status, as a set of digital photographs taken anonymously on a smartphone, are considered in certain cultural contexts as ‘a theft’, a taking of the subjects’ soul. If I proceed on the basis that the theft exists as embodied within the image, do the methodologically introduced shifts that occur as planned meeting-points through the subsequent material encounters challenge the theoretical starting point and its implied stolen status? 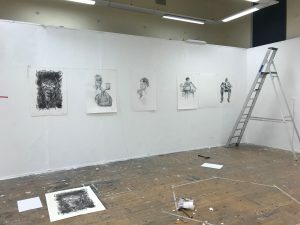 Material shifts happen through a process of intensive attention to the re-interpretation of the subject from photographic document to drawn and, finally, printed image. My current theoretical research attempts to respond to this hypothetical quandary by questioning whether the ‘attended to’ marks can amend the potentially fraudulent nature of the ‘taken’ image? The drawing mark-making process begins with copying. A concurrent discourse questions this process as inferior, less artistic, less pure, or perhaps even dishonest as it is less ‘earned’? All the above hypothesises are being unpacked, tested and questioned through material encounters that culminate in a drawn and printed object that has come to symbolize the maker’s intentionality towards making honest, the dishonest act. In a circular narrative the final encounter of maker, portrait and subject can be understood as a moment of forgiveness. 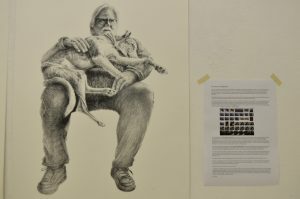 The drawing marks are detailed and capture the focus of this senior arts player. There is an evenness to the to the mark making that reflects the considered, non-bombastic nature of the man as he focuses and listens. The light spectacles rest on his nose and the fine spectacle arms disappear into the hair, past the eyebrows and eyes as they stare out to his subject. The leather watch-strap is drawn in detail as this is a sign of the man’s generation and ‘choice of quality’. The clasped manicured hands are drawn in fine detail as his chin rests on them as they support his calm head. The arms and elbow support the hands and head as they rest on the unseen surface. There must be two arms as the hands are clasped, however they are represented as one, bringing a uniformity to the composition. The well-starched shirt tapers away into the paper providing a vertical drop to the right of the composition, indicating the man’s back without it being drawn. There is a vertical grounded quality to the composition that the subject is grounded in his role. 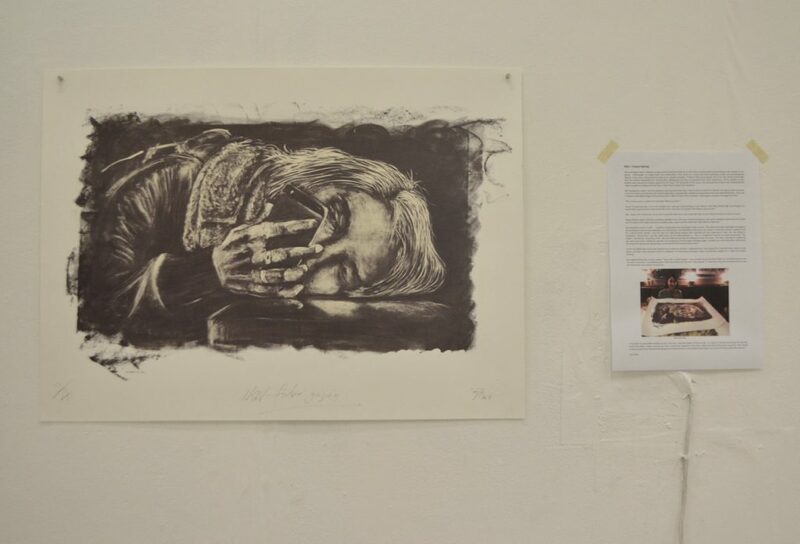 Eliaine is Professor of Printmaking at Dundee University. 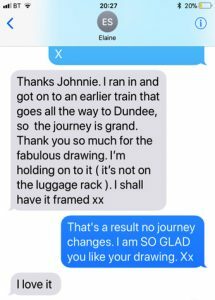 After the many years since we studied together at the Royal College of Art, I contacted her to explain that I was embarking on a practice based PhD. She encouraged me to visit and discuss what this might mean. Arriving a little early, I took the opportunity to look round the Dundee Contemporary Art Gallery, when I heard a voice call “Jonnie?” I turned and we recognised each other after all those years. Elaine showed me round the DCA open access Print workshop; the extensive printmaking department she had developed as well as the research hub she has established. We saw the towering new Wellcome Trust Life Sciences building that her exterior ‘prints’ adorn. 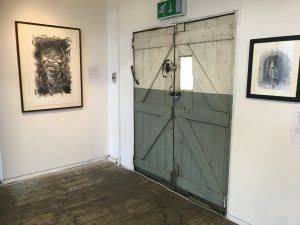 The extensive facilities put printmaking high on the agenda in Dundee and her research and print has driven her to create, exhibit and present beautiful and insightful work across continents. Generously she welcomed me to her home and offered me tea over breakfast. What followed was an intense and enjoyable three hours sharing of what Print has meant to Artists over the centuries, and what considerations I might make as I begin my research. This insight and encouragement was most welcome and I hoped I had also made a start to a portrait that would celebrate Elaine and her generosity of spirit. The portrait was made from a series of smart phone photographs ‘taken’ during our discussion. I warmed to the images featuring the tremendous, tartan tea cosy in the foreground. When Elaine’s hands balanced her cup to the left and head to the centre, the portrait began. The technical work on this piece is noted elsewhere in my research, but the drawn composition and focus of her eyes came together to make an idiosyncratic, but honest interpretation that I felt able to share with the subject. What would it be like? Would I be old? Would my hair be awful? But when I saw it, it wasn’t that superficial physicality I saw, but myself. I saw into myself. Later I shared it with my son and he said: its like you are, Mum”. I was more than happy that the portrait enabled Elaine to see into herself and for a mother to share with her son. Elaine was so honest to explain that she hesitated, hovered before clicking open the digital file – we are all concerned about our image, and how others may perceive us in this age of overabundant images. HERMON GREEN, EROKAWORLD – EXCLUSIVE AND UNIQUE CLOCKS AND TABLES. 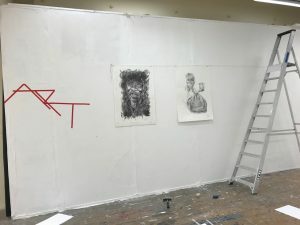 I draw portraits in my studio in the Old Print Works and surround myself with works in progress and finished silkscreen prints. 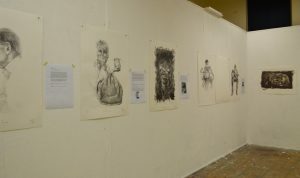 Hermon, a fellow studio maker dropped by and commented positively about the portraits on the walls. We talked about how I make the portraits from smart phone photos made surreptitiously, to capture the essence of the subject when in regular conversation, rather than in ‘presentation mode’ when aware of being photographed. Hermon got the reasoning and could see it in the resultant prints. He dropped in that he would understand if I wanted to portray him! It took 3months and a few chats/meetings to achieve a starting image that reflected Hermon’s character to begin a drawing. Another 6 months on and the printed silkscreen portrait using the ‘light out dark’ drawing method was completed. The ground was built up with charcoal on the mark resist film. The centre of the ground was evenly applied. The edges were left with sweeps of the charcoal stick and the edges of the photocopy beneath were left intact to provide a frame within a frame. 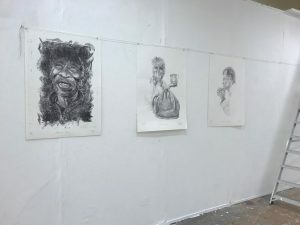 The highlights were ‘rubbed in’ with an eraser and the shadows deepened with charcoal and graphite.The thin lines scratched out of the graphite and charcoal, provide detail in contrast to the more gestural marks composing the face and grounding. 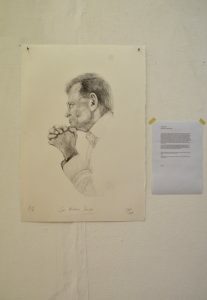 There is a tactile materiality to his portrait born out of the range of drawing techniques and attitudes the marks convey. The portrait is set in an expressive non-realist ground that evokes values of the personality. 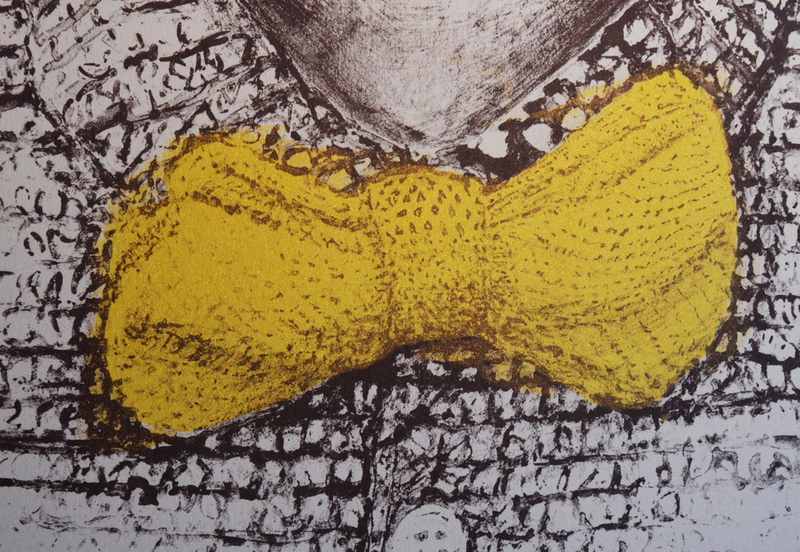 A coating of varnish brings luminesce to the ink and the retention of the straight and scissor jagged edges reminds us that this is a print that has been created using tools and techniques beyond the pencil. Hermon has the first print in the edition of 4. It hangs in his home. He and his partner say that the portrait changes. Recently he looks happier. 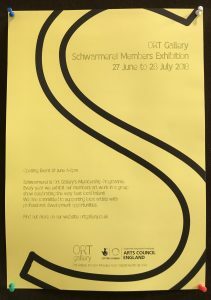 Print No 2 is currently hanging in the ORT Gallery as a part of the Schwarmerei show where it can be viewed it in a formal situation. The word “portrait” comes from the Latin “portrahere,” translated as “to drag out, reveal, expose.” Walker,16. Portraits have always been more than just a record. They have been used to show the power, importance, virtue, beauty, wealth, taste, learning or other qualities of the sitter. Tate. The Oxford English Dictionary’s first, and most common definition of portrait is: “A drawing or painting of a person, often mounted and framed for display, esp. one of the face or head and shoulders. The tradition of portraiture is to make a single all encompassing image. From time to time Artists have tried to make multiple images of a subject in one frame. 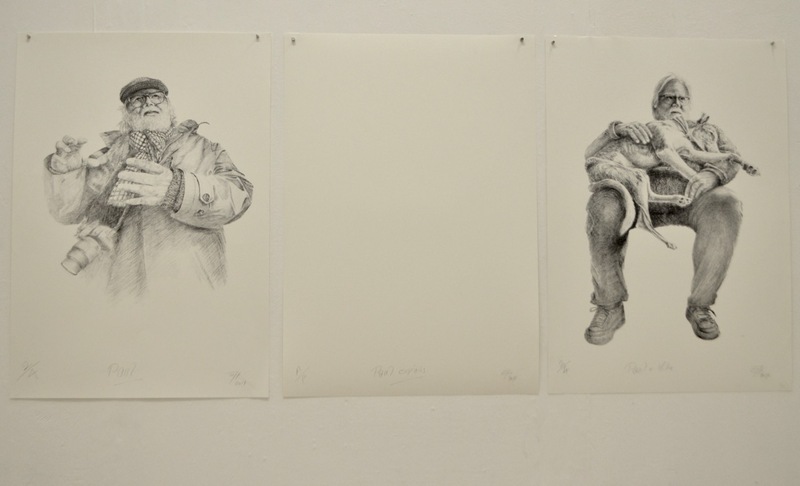 Perhaps three portraits of a subject may give a more insightful representation? I had ‘smart phone photographed’ Paul Kenny on a number of occasions and putting all the images together as if on a photographic contact strip allowed me to see how a number of images could be selected to give a fuller picture of the man. Drawing two more portraits of Paul gave the opportunity to test the concept that three might be better than one, to reflect the wealth and warmth of Paul’s character. 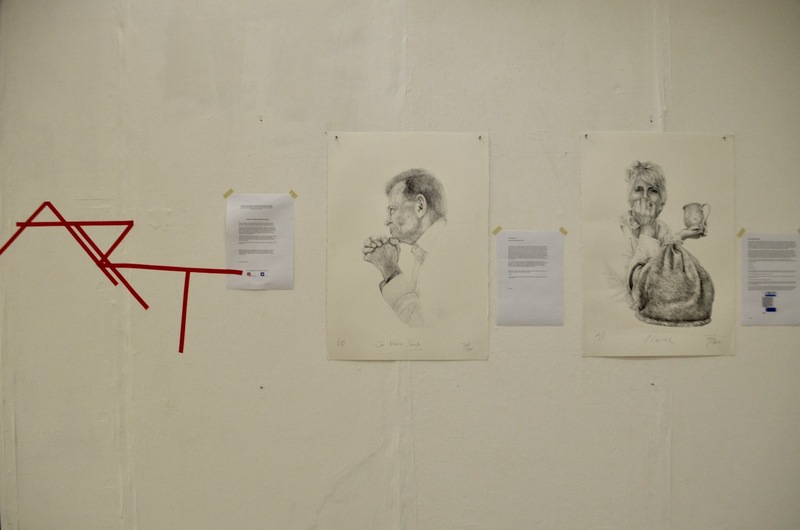 The first portrait in this triptych, ‘Paul Explains’,began from our exchange in his front room in North East of England where he was in full flow, engaging and committed to sharing a belief. The second Portrait :‘Cheswick Beach Explanations’ was begun by selecting from a number of phone photos, made on a seacoast walk. Sea walks are core to Paul’s work as he collects materials from shores that become the basis images. 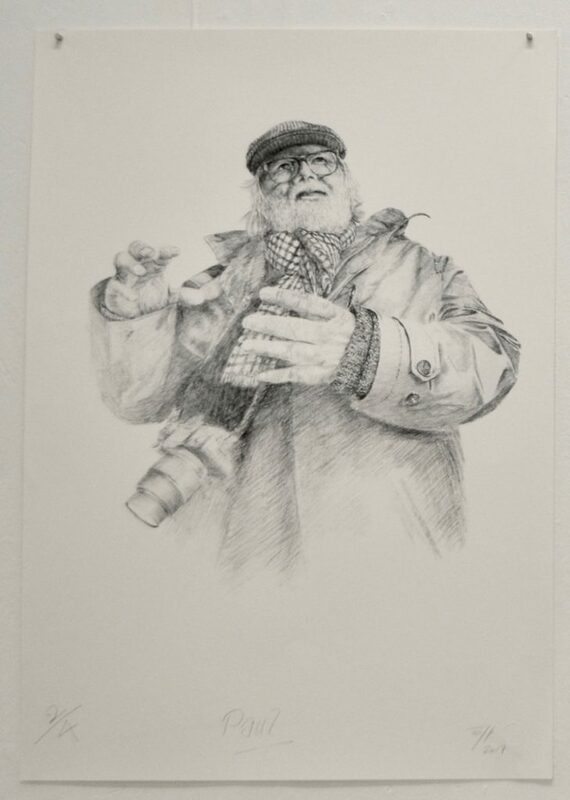 Paul had added to his indoor apparelle with his cap, scarf, waterproof coat and a small slr camera. 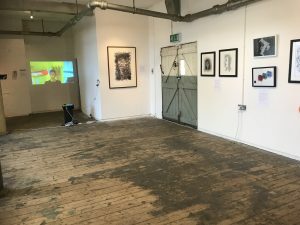 Paul’s brilliant photographic image making uses mesmerising, detailed and temporal methods to create his images using analogue and digital techniques in his darkroom, studio. His SLR is more for personal and non artistic use, so to include it in the portrait is a play on his artistic practice – i.e. he will invariably never create his art with this camera, but here he has it slung around his neck as if a ‘photographer’. 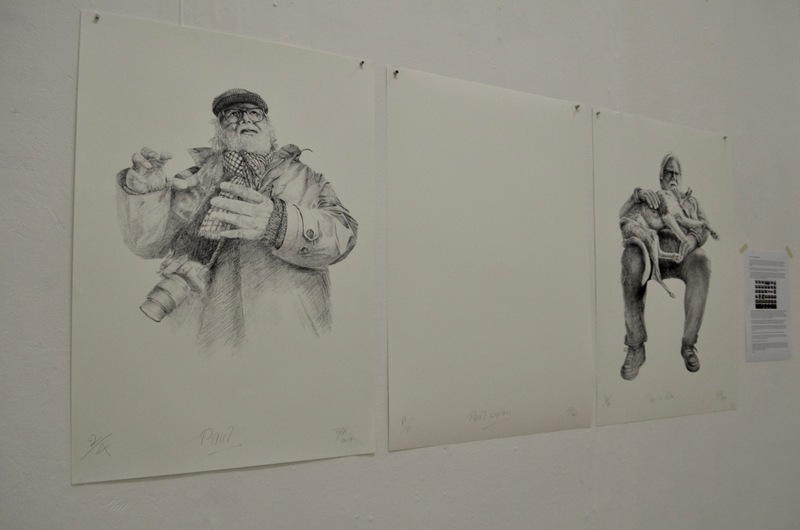 Paul and I were both taught by Geoff Lowe at Newcastle Poly fine art department. I remember Geoff saying that cameras are like male jewellery. This stuck with me as a comment on the camera as male appendage way back in the early 70’s, (nineteen seventies) while I was tussling with images and art created through photography, print, film, book and poster making in the era of ‘conceptual art’. 40 Years on Paul and I have met again through the ubiquitous democracy of social media, that has connected us through the internet which had only been a glint in Sir Tim Berners Lee’s eye. Photography was analogue, electronic video was just becoming available and our current digital world of technology and communications was only being researched and investigated by scientists. 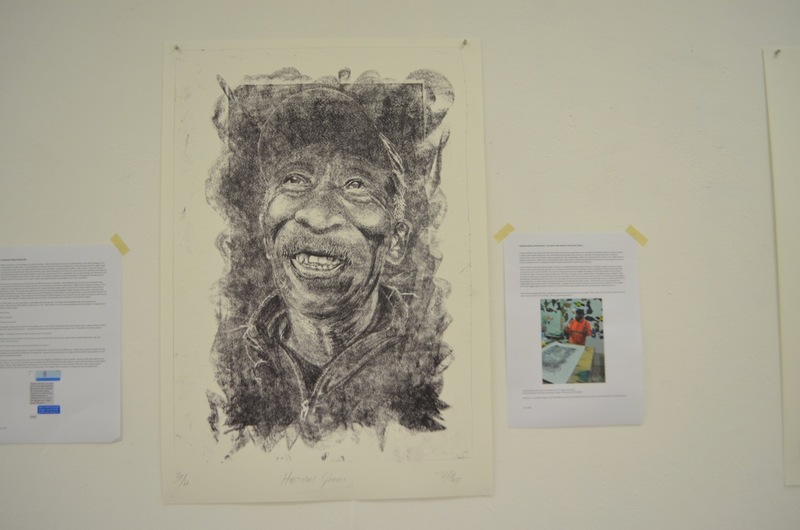 What of Drawing and Print Making now? 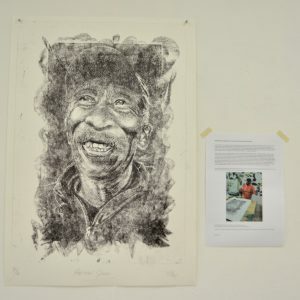 “I’ve been trying new fine silkscreen meshes and emulsions to make prints from my drawings and I wanted to make portrait of, and for you because you have been so welcoming over the past couple of years since we connected again. But when I settled down to make a portrait I couldn’t decide which would be the single image that would do it. So I made three! I like the idea that there is a triptych! I hope you do to. Hi Jonnie, I’m flattered, both by the kind words and the images. I feel it’s only fair to be honest, two of them I really love and feel they are “me”, the middle one I’m not so sure about …I think I look a bit like an insane Michelin man….. you’ve caught all the things about myself I hate…but I suppose that’s what portraits are about. Whatever, I’d love to see them, when are you next up? 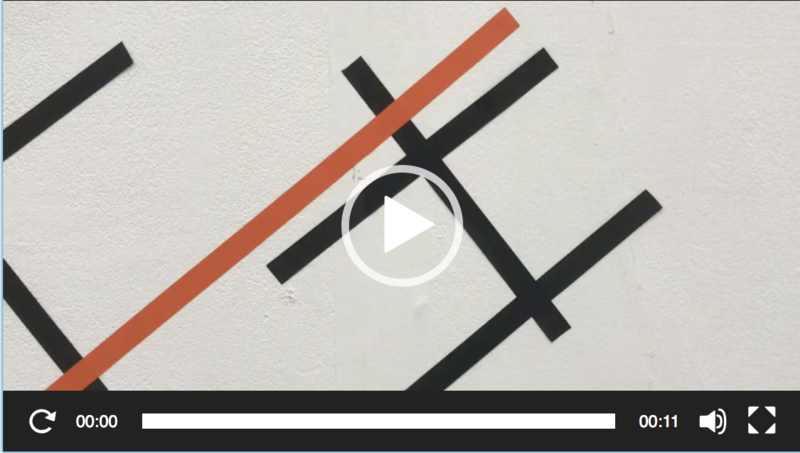 I travelled to the North East and was treated to insights into Paul’s new work that will be exhibited in the Western Isles and coincidently in Birmingham’s Argentea gallery. In Paul’s studio I unrolled the first two large scale prints which were met with positive responses and feedback. Together we looked at the last portrait and Paul understood what I was aiming at, as I explained that I wanted to reflect his enthusiasm when engaged in conversation about subjects close to his heart. He understood, but could not get over his initial feelings of revulsion! We agreed that I would not show it. The exhibit is a triptych, minus one. I began this print 6 months ago when I noticed a young woman resting her head on a an Arts Centre window table concentrating on the content on her phone. ‘Instinctually’ is a laden word, but Instinctually, I was drawn to a scene that held something visually and psychologically distinct. It was not a usual position to take up in a daytime situation. It felt as if the young woman was in her own world and the light from the window illuminated her concentration. Making the print has accentuated these initial impressions. All the signifiers to the location were removed to create a ground for her concentration. 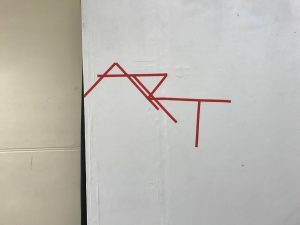 The materiality of the drawn and subsequently printed marks delineating the subject created an ambience for her focus, rather than a reality to be located in. 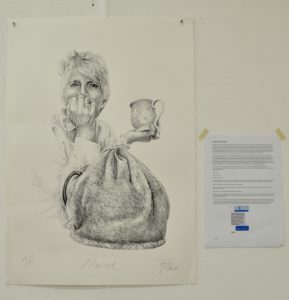 Happy that the subject had seen something valuable in the print also created an anticipation, and some trepidation about how she would see the reality of the large scale print on quality paper, colour and the marks that I have made to reflect her. We arranged to meet in a cafe – ‘I could be recognised by the roll of paper under my arm’. The cafe was lit with small lights throughout illuminating the warm brown upholstery and wall pictures, not dissimilar to the brown ink I had mixed to make the portrait. I looked around for a blond haired woman, but met the eyes of a dark haired person who indicated she was expecting to meet me. We smiled in recognition. Sitting down I put the rolled prints on the table between us. This is a heightened meeting for both participants. The subject, meeting the anonymous artist, who has made her portrait and offered to meet and share. The artist, meeting the subject he has spent many hours making her portrait, but knowing her only through a fleeting image, recorded one sunlit afternoon. How would she respond to the process and portrait, as we meet for the first time face to face. At first we talked at first about when I had seen her to begin the portrait and what had inspired me to make it. I explained how I had noticed her, head laid down intent on the phone, and how I had retrieved it from my collection of ‘moments when thinking what would be a subject for a ‘light out of dark’ drawing. Nav explained that this moment meant: “more than I could imagine. I was considering big decisions about my immediate future, but Lets look. I’m excited.” I unrolled the print in full view of the café. Nav was ‘really pleased’. It captured a moment of decision for her and her family that I was unaware of until now. It has been so worthwhile seeking out the, until now, anonymous subject of this portrait which I and other print room colleagues respond positively to. To meet for the first time and across the portrait, to hear that it means more to her than I could have imagined at the time, makes the work all the more important. The circular creative process from discreet photography to considered drawn and printed artwork gives me succour for this practice led research. 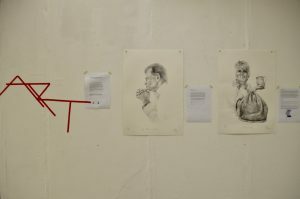 This PhD Lab presentation primarily deals with the investigations into the relationship between the subjects of portraits and the artist from the Series: People in the Arts. My PhD Practice led research is interdisciplinary. The practice itself is multidisciplinary.In this summary I have not presented the range of technical experimentation and research I am engaged in to develop new silkscreen printing and drawing techniques. However I have included close up videos of the drawn prints below. They illustrate the constituent elements of ink deposits that go together to make up the total portraits. These are determined through the range of decisions made on the process to make the drawn graphite marks made on textured film to create the original drawn positives.